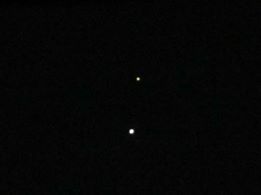 According to Sky and Telescope, many across the United States will get a spectacular view tonight of the planets Venus and Jupiter. 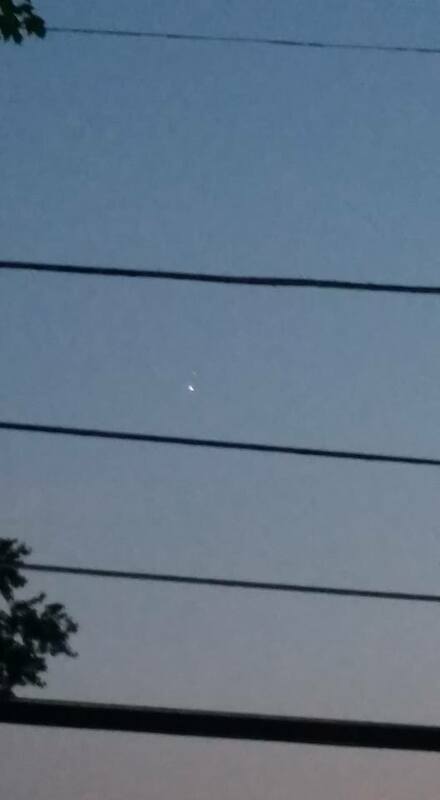 Have you noticed in the night sky how both the planets have been close to each other? According to the online article, at the beginning of the month, the two planets were 20 degrees apart in the evening sky. 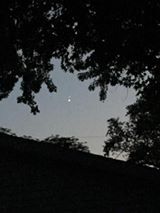 Over the past several weeks, Jupiter and the stars behind it have been gradually slipping lower in the evening twilight. 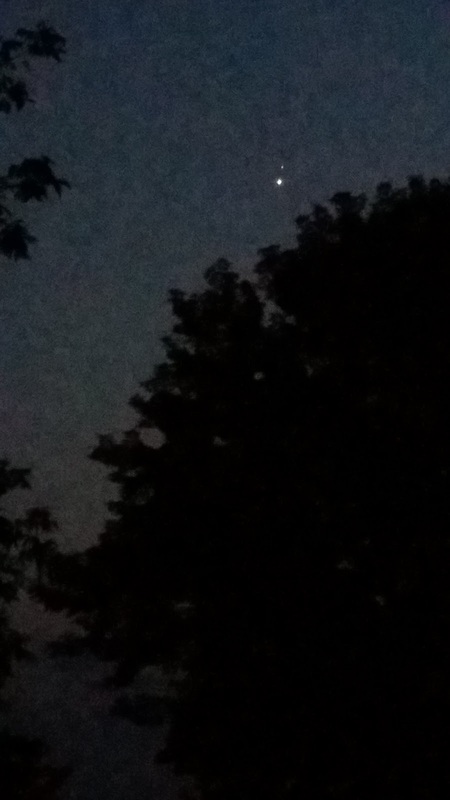 But Venus has remained high up. Because of this, the planets will come within a third of a degree of each other, making it appear as one bright, double star in the evening sky. It was a very pleasant day in Rockford and along the Stateline, but you may have noticed a bit of a milky/hazy look to our clouds. That's because smoke from wild fires in Alberta, Canada has drifted into much of the central United States. 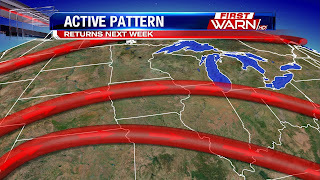 The jet stream pattern was positioned in a way so as to take that smoke over much of northern Illinois and southern Wisconsin. Visible satellite pictures gave us a very clear picture of this trend today and will keep us under mostly cloudy skies for tomorrow! With the rain the past couple of days the State of Illinois broke it's previous record for the wettest June on record, breaking the old record from 1902. 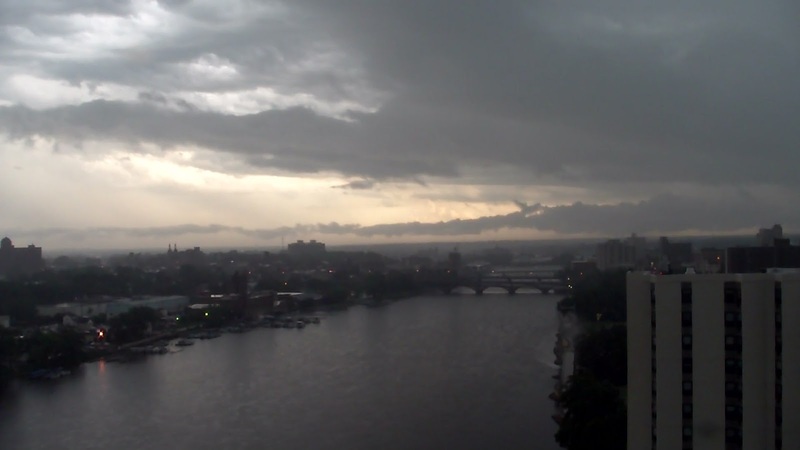 With the rain totals now in from yesterday's storms; its not only the wettest June but it is also the second wettest month the State has seen - since records started in 1895. The statewide average precipitation is now up to 9.37 inches! With more storms and rain expected across the state we will see this total jump, and will have June monthly totals tomorrow. Last Day of June Gets an Extra Second! Today will be one second longer than any other day. This day we add one leap second at 6:59pm central time or 23:59:59 UTC time. This is done to keep atomic and astronomical clocks synced together. They begin to differ because the rotation of the Earth isn't always constant, it is actually slowing down, but does so unpredictably. This makes it very hard to set clocks accurately. The first time we saw leap seconds added was back in 1972, and at the time they had to add 10 seconds because the two different clocks were so far apart. While many people won't notice the change, there could be some issues with computers that haven't been programmed to this extra second. The last time we added a leap seconds - in 2012 - there were some computer sites that crashed because they weren't adapted for the change. For more information on the leap second you can click here. I hope you enjoy your extra second! There's been no shortage of significant weather this past week, and tonight was no exception. What started as building thunderstorms this afternoon and evening, turned into a tornado warning for Lee County. Now, tonight's atmospheric set up was nothing like that of last Monday when a supercell thunderstorm produced an EF2 tornado in Woodhaven Lakes. 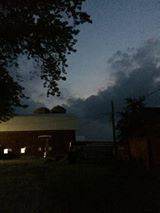 The atmospheric set up tonight was more conducive for brief tornadoes and weak funnel clouds, but dangerous nonetheless. A shift in the jet stream pattern over this past weekend allowed for an extensive ridge to build across the Northwest, causing record breaking heat in the Northwest, and a cooler weather pattern across the Midwest. But, what that cooler pattern has allowed for are many upper level lows to spin down from the northwest. While the atmosphere isn't necessarily primed for active and severe thunderstorms, each low that comes down from the northwest causes just enough spin in the atmosphere for thunderstorms to develop causing rotation. 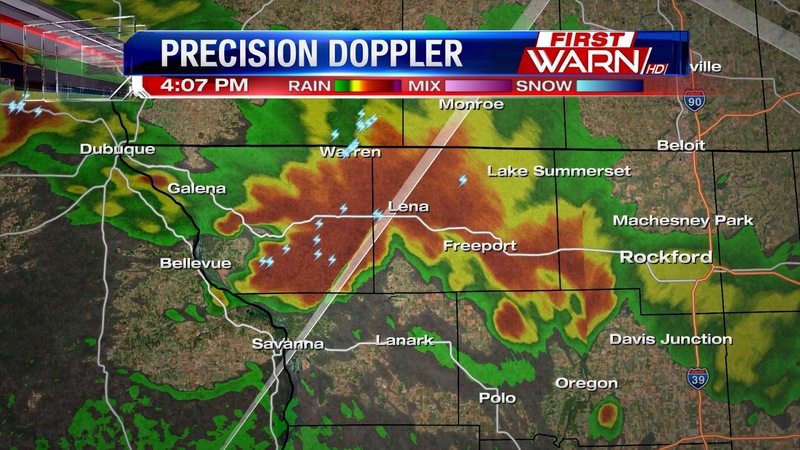 While the severe threat remains low, there are thunderstorms moving through Southwest Wisconsin and Northeast Iowa. Should these hold together, they will make it into Northern Illinois between 9pm and 10pm. It's officially the wettest June on record for the state of Illinois; according to the State Climatologist office for Illinois. 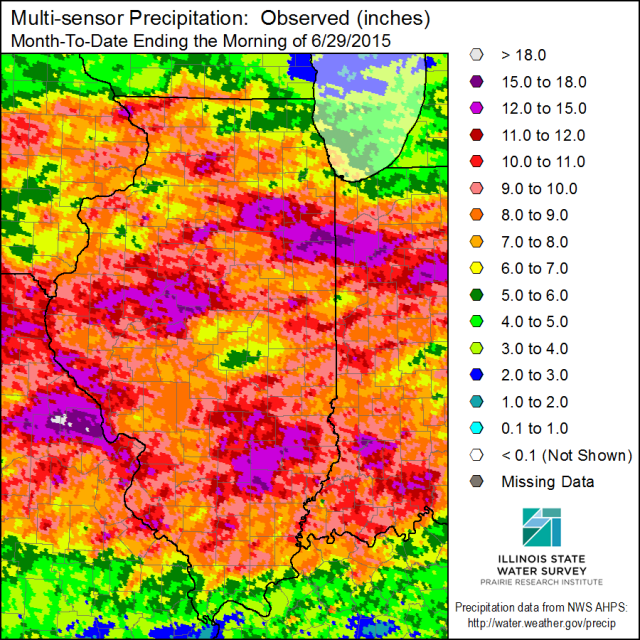 Illinois has now passed the old record of 8.12" set back in 1902. Now surpassing the 113 year-old record, the rainfall total currently sits at 8.91". With almost 2 days left in the month, and more showers and storms in the forecast, we will see this number continue to rise. For the city of Rockford, we are officially right where we should be in terms on rain. The official number is observed at the Rockford airport. We are sitting right at 4.39" which is spot on for the month. However, locally we have received much higher amounts, and you can see with this rainfall map of the state. The areas in green are 5-8 inches of rain. The blue to purple shading is 8 to 11 inches! You can see that most of northern Illinois is in the 5-11 inch category, while southern Wisconsin has seen about 1-5 inches. We don't see much of a break from the rain anytime soon - the Climate Prediction Center has us highlighted again for above normal precipitation through July. 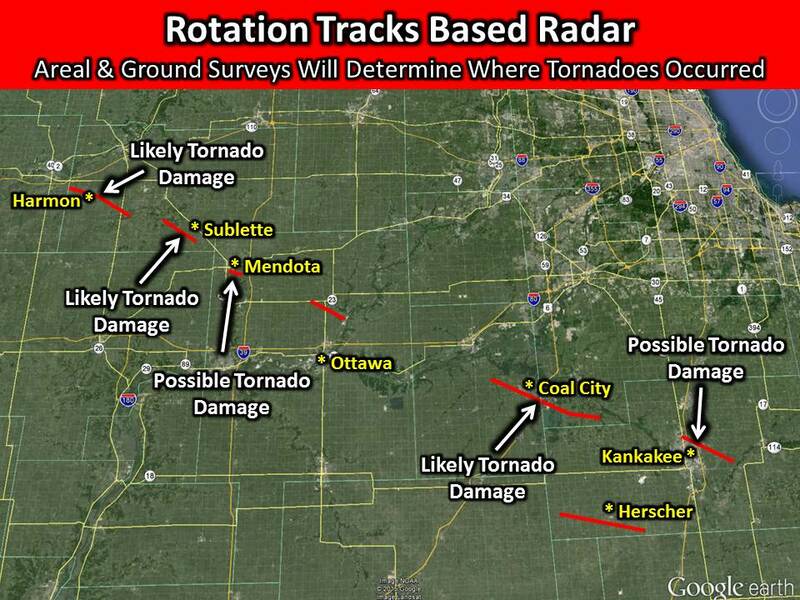 On Monday June 22nd in total 10 tornadoes touched down through northern Illinois, with four of those being in the Stateline region. Here are a few facts from the severe weather event. 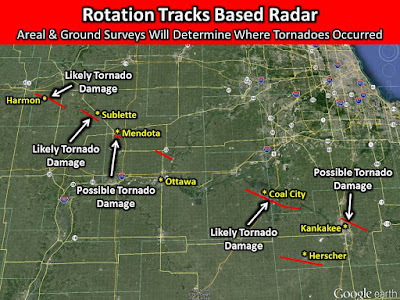 A total of ten tornadoes occurred in Northern Illinois. Nine of those occurred from one long lived rotating storm which is known as a cyclic supercell storm. 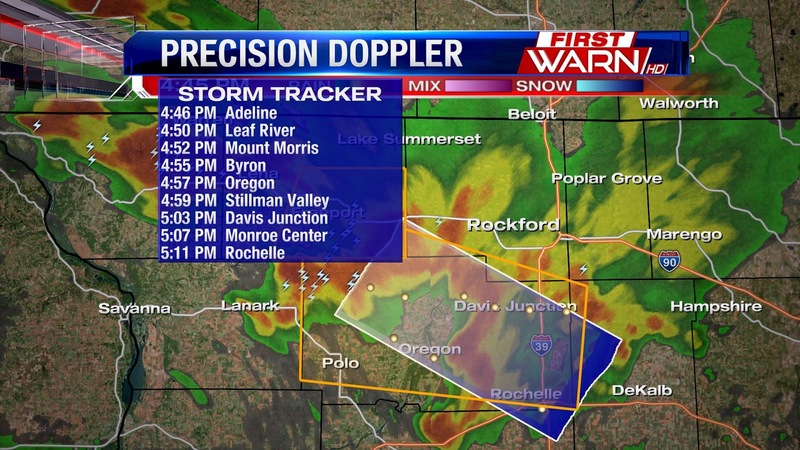 It tracked across Whitside and Lee counties, as well as LaSalle, Grundy, Will, and Kannakee counties. The heaviest damage was in Coal City and Braidwood which was hit by an EF-3 tornado with maximum winds at 160mph. The second was the Woodhaven Campgroung in Sublette (Lee County) caused by a high end EF-2 tornado with maximum winds at 130mph. There were 12 people injured but not fatalities. One tornado occurred in Whiteside county, one that started in Whiteside and tracked into Lee, and then two more in Lee county. Here's a break down of each tornado from the National Weather Service. SURVEY SUMMARY: MAINLY DAMAGE TO TREES AND POWERLINES. A ROOF BLOWN OFF A BUILDING IN HARMON. STORM SPOTTERS ASSISTED WITH THE IDENTIFYING OF THE TORNADO. .
For the full report from the National Weather Service click here. TORNADO REPORT UPDATE: The National Weather Service in Chicago has upgraded the Coal City tornado to an EF-3 with max wind speeds at 160mph. At its widest point, the tornado was 3/4 mile wide traveling nearly 16.5miles. 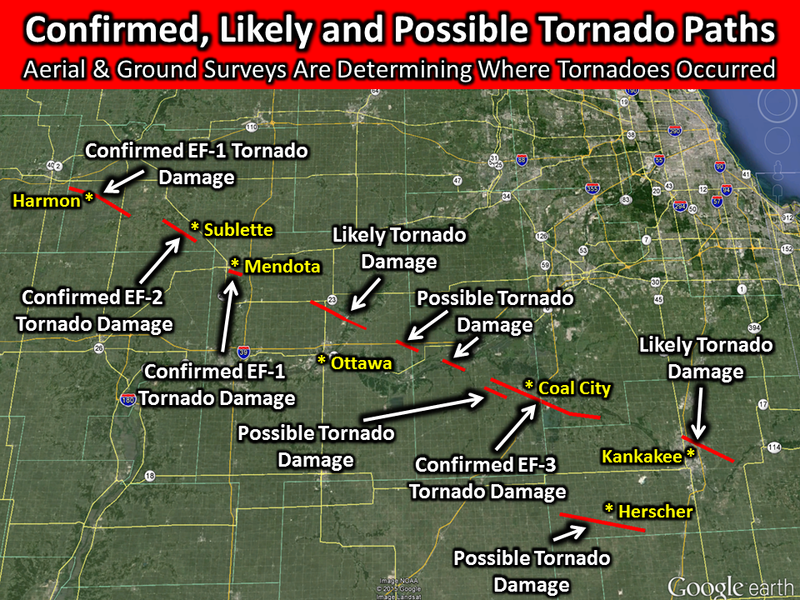 The NWS has also confirmed that an EF-1 tornado occurred near Harmom, Illinois in Lee County. 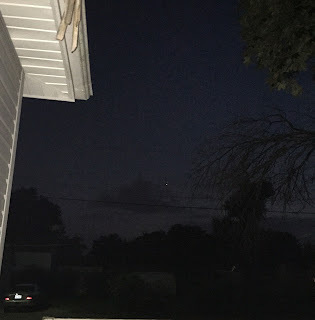 They also have confirmed that the Woodhaven lakes and Sublette tornado as a high EF-2 with wind speeds up to 130 miles per hour and a half a mile wide path. 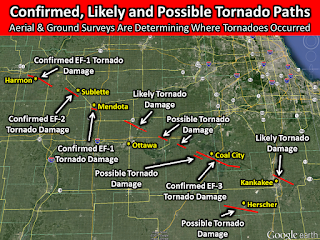 So far there have been four total confirmed tornadoes for Northern Illinois on Monday. We'll keep you updated as the NWS assessment teams report in! It was a long day for many across the Stateline yesterday after we saw multiple rounds of severe weather. The area was primed for severe weather with a very warm and humid air mass in place as well as a strong low pressure system moving just north of the area, and a strong jet headed into the region. In the morning a mesoscale convective system tracked across northern portions of the area with help from an approaching warm front. There were multiple severe thunderstorm warnings across the area with this storm. The biggest threats for this system were torrential rain and possible flooding, as well as hail and very strong damaging winds. While the storm was still in Iowa, wind speeds were clocked at 93.9mph! 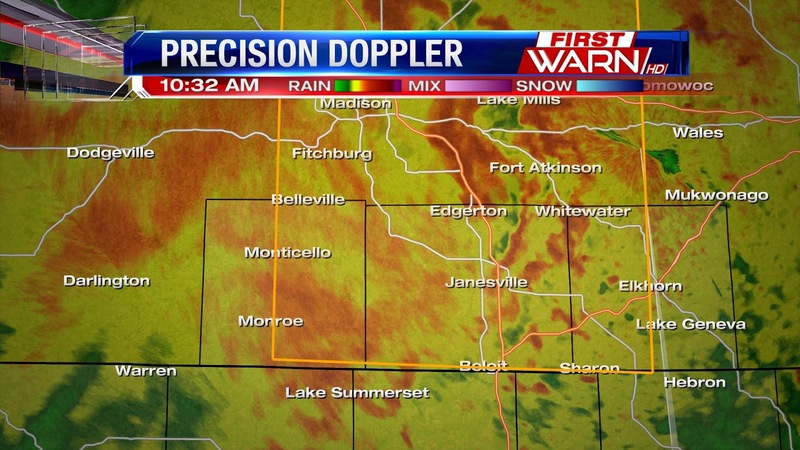 It weakened a bit but we still saw 70mph wind gusts across the area. 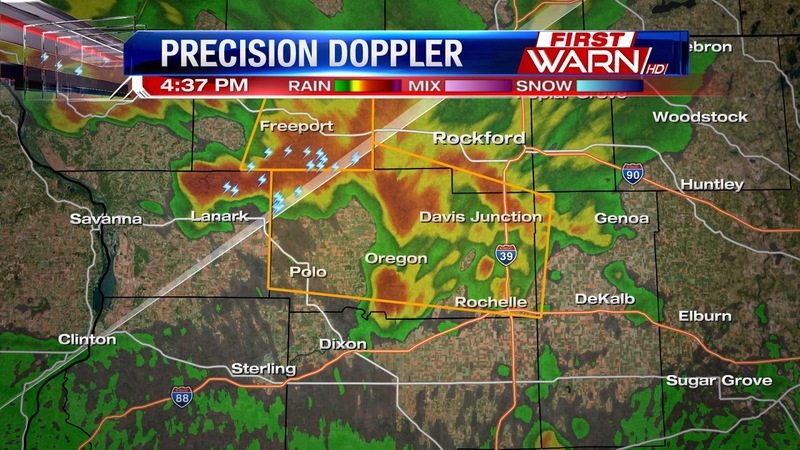 This led to quite a few reports of damage across northern Illinois and southern Wisconsin. The low pressure system tracked just north of the area with a trailing cold front. This front along with some help from outflow boundaries helped with storm development later in the day. A tornado watch was issued just before 4:00pm for southern portions of the Stateline area. This is where we saw multiple tornado warnings for a cyclic supercell that tracked through Whiteside and Lee counties in the early evening. The confirmed tornado was in Sublette which is in fair south eastern Lee county and then tracked to the south east. The National Weather Service from multiple agencies will be out this afternoon and evening taking damage surveys on the ground as well as in the air to confirm how many tornadoes hit the area. However here is a look as some of the rotation paths that were indicated on radar. You can see five highlighted areas that the National Weather Service will be looking at today. If you have storm pictures, of the damage, the storm itself, or even interesting clouds you can send them to weather@wtvo.com or tweet them to us. We also have the First Warn Weather App that lets you send them in! Damage pictures are a great tool for the NWS to help determine what type of damage occured. 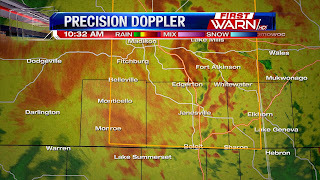 Along with the severe weather threat yesterday of tornadoes and damaging straight line winds, the Stateline area also received torrential rain fall within the storms. Here's a look at some of the local rainfall amounts from the NWS. 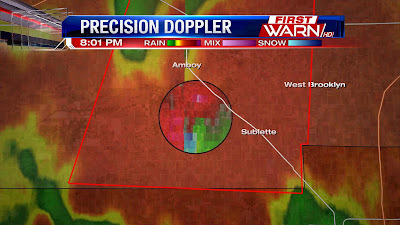 (8:04:02 PM) nwsbot: LOT issues Tornado Warning [tornado: RADAR INDICATED, hail: <.75 IN] for La Salle, Lee [IL] till 8:45 PM CDT ...AT 803 PM CDT...A SEVERE THUNDERSTORM CAPABLE OF PRODUCING A TORNADO WAS LOCATED NEAR AMBOY...OR 9 MILES NORTHWEST OF MENDOTA... MOVING SOUTHEAST AT 30 MPH. THIS STORM HAS A HISTORY OF PRODUCING SIGNIFICANT DAMAGE. (8:01:48 PM) nwsbot: LOT continues Tornado Warning [tornado: RADAR INDICATED, hail: 1.00 IN] for Lee [IL] till 8:15 PM CDT ...AT 800 PM CDT...A SEVERE THUNDERSTORM CAPABLE OF PRODUCING A TORNADO WAS LOCATED NEAR AMBOY...OR 9 MILES SOUTHEAST OF WALTON...MOVING SOUTHEAST AT 25 MPH. 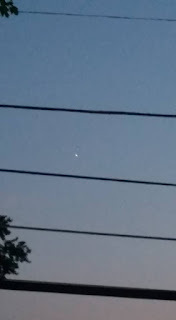 AT 756 PM. 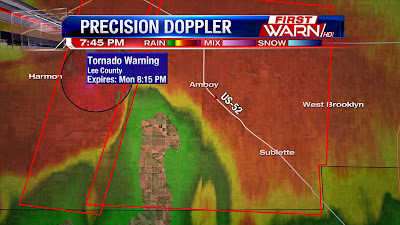 SIGNIFICANT DAMAGE WAS REPORTED WEST OF SUBLETTE WITH THIS STORM. 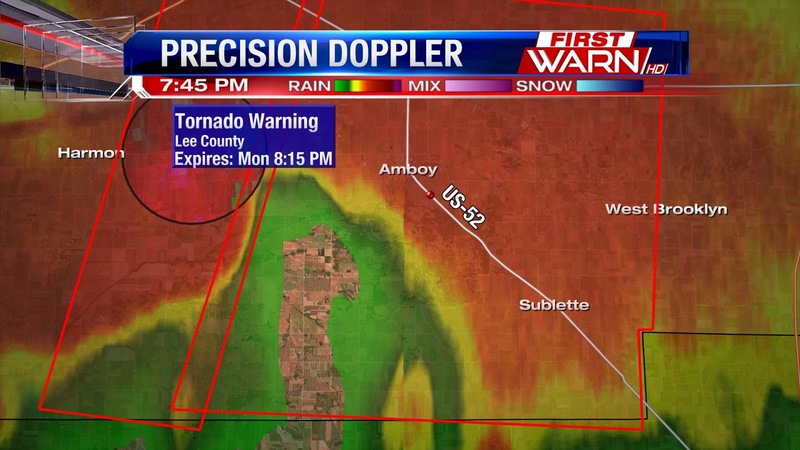 UPDATE: 7:47pm TORNADO WARNING continues for all of Lee countil until 8:15pm now including HWY 52 as well as Amboy and Sublette. There are no confirmed tornadoes on the ground but there is radar indicated rotation with this storm as well as torrential rainfall and large hail possible. UPDATE: TORNADO WARNING expands into further into Lee county. Amboy now included in this warning, and 2-3 inch rain fall rates as well. UPDATE: Tornado Warning Continues for Lee County until 8pm. 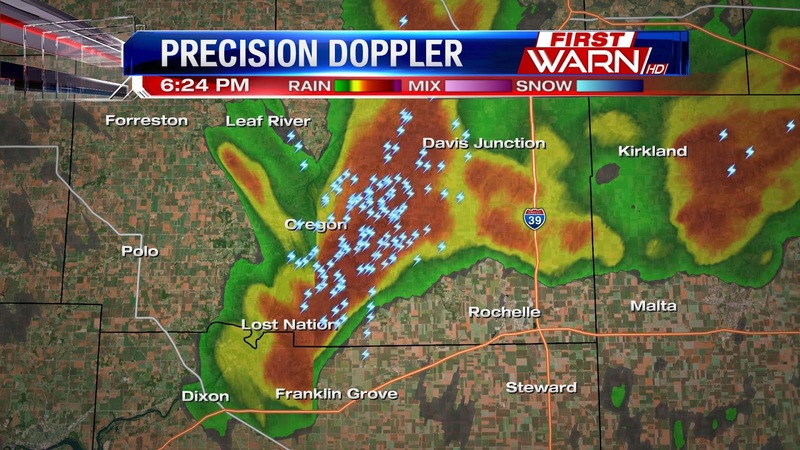 Still seeing some rotation over I-88 and US-30. No confirmed tornadoes on the ground. 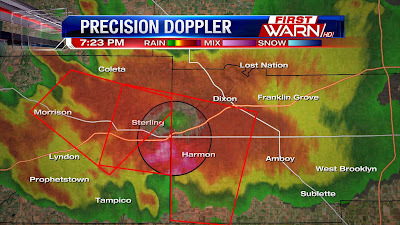 Tornado Warning Continues: Whiteside county until 7:30pm and Lee County until 8:00. There has not been a confirmed tornado on the ground but you will want to take cover immediately. Torrential downpours could hide the tornado. 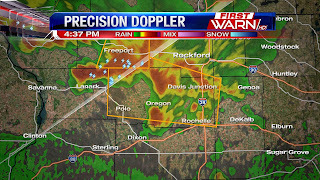 7:02:41 PM) nwsbot: DVN continues Tornado Warning [tornado: RADAR INDICATED, hail: 1.50 IN] for Whiteside [IL] till 7:30 PM CDT ...AT 701 PM CDT...A SEVERE THUNDERSTORM CAPABLE OF PRODUCING A TORNADO WAS LOCATED OVER EMERSON...OR NEAR STERLING...MOVING EAST SOUTHEAST AT 35 MPH. 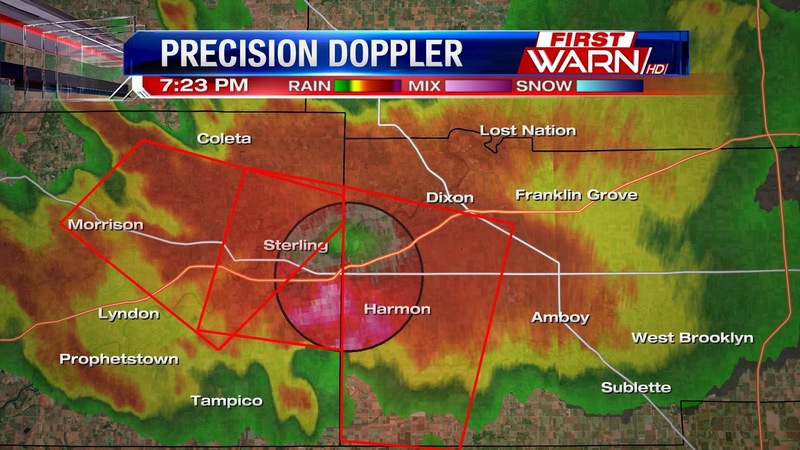 (7:04:38 PM) nwsdvn-tim.gross: #social Storm chaser saw a funnel reach 3/4 to the ground just NE of Morrison, IL. Storm likely producing tornado. 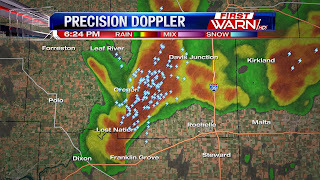 (7:06:14 PM) nwsbot: DVN continues Tornado Warning [tornado: RADAR INDICATED, hail: 1.50 IN] for Whiteside [IL] till 7:30 PM CDT ...AT 705 PM CDT...A SEVERE THUNDERSTORM CAPABLE OF PRODUCING A TORNADO WAS LOCATED OVER EMERSON...OR NEAR STERLING...MOVING EAST AT 50 MPH. (7:16:40 PM) nwsbot: DVN issues Tornado Warning [tornado: RADAR INDICATED, hail: 1.75 IN] for Whiteside [IL] till 7:30 PM CDT ...AT 716 PM CDT...A SEVERE THUNDERSTORM CAPABLE OF PRODUCING A TORNADO WAS LOCATED OVER ROCK FALLS...MOVING EAST AT 50 MPH. (7:17:31 PM) nwsbot: Local Storm Report by NWS DVN: E Sterling [Whiteside Co, IL] trained spotter reports HAIL of penny size (M0.75 INCH) at 07:12 PM CDT -- reported near applebees on rt 2. (7:18:17 PM) nwsdvn-ray.wolf: Tor warning coming soon for small circulation in western Rock Island county. 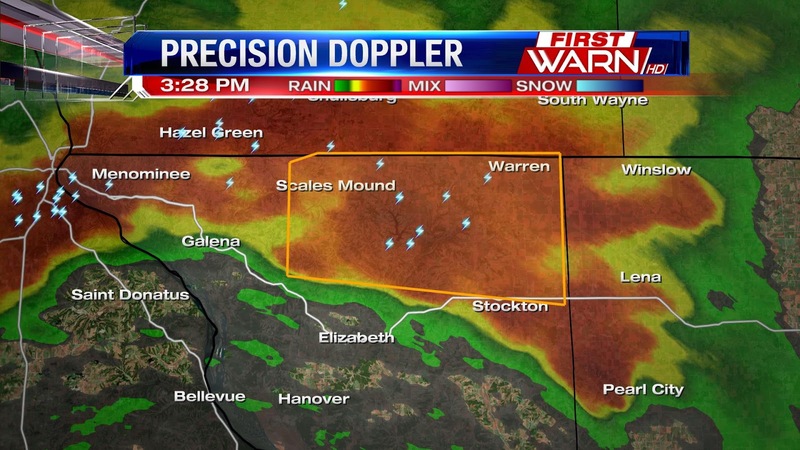 A severe thunderstorm warning has been issued for Whiteside County until7:15 PM. go inside a sturdy building immediately and stay away from windows. large hail and 60 MPH winds are possible..
A tornado watch is now in effect until 11:00 PM for Carroll, DeKalb, Ogle, Whiteside and Lee counties. Stay alert! The severe weather threat remains for the entire area, and the wind change in direction/speed with height is growing increasingly dangerous at the KDVN radar site! SUMMARY...ONGOING CONVECTION CONTINUES ACROSS THE DISCUSSION AREA...WITH HAIL THE PRIMARY THREAT. REDEVELOPMENT ALONG/SOUTH OF AN OUTFLOW BOUNDARY AND ALONG/AHEAD OF A COLD FRONT WILL POSE A GREATER THREAT LATER THIS AFTERNOON...WITH LARGE HAIL...DAMAGING WINDS AND A FEW TORNADOES POSSIBLE. WW ISSUANCE MAY BE NEEDED LATER THIS AFTERNOON. DISCUSSION...STRONG TO SEVERE THUNDERSTORMS CONTAINING LARGE HAIL ARE ONGOING ACROSS EASTERN IOWA. THESE STORMS WERE ELEVATED ATOP A COLD POOL LEFT BEHIND FROM AN EARLIER MCS...WITH STEEP LAPSE RATES/INSTABILITY ALOFT CONTRIBUTING TO A CONTINUED HAIL THREAT. ADDITIONAL SHOWERS AND STORMS WERE DEVELOPING SOUTH OF AN OUTFLOW BOUNDARY ACROSS SOUTHERN/SOUTHWESTERN IOWA...BUT THESE STORMS WERE LIKELY ROOTED ABOVE A STRONG CAP AT AROUND 750 MB. THESE STORMS MAY ALSO YIELD A SMALL HAIL THREAT THIS AFTERNOON....BUT SHOULD REMAIN LARGELY SUB-SEVERE UNLESS THEY CAN BECOME SURFACE BASED THIS AFTERNOON. LATER THIS AFTERNOON...STORMS ARE EXPECTED GRADUALLY BECOME MORE SURFACE BASED WITH DEVELOPMENT EXPECTED ALONG A SEWD-MOVING COLD FRONT IN IOWA...AND ADDITIONAL DEVELOPMENT POSSIBLE ALONG NEARLY STATIONARY OUTFLOW BOUNDARY LOCATED ACROSS CENTRAL IOWA AND WESTERN ILLINOIS. RECENT HI-RES GUIDANCE SUGGESTS THE GREATEST LIKELIHOOD WITH THIS DEVELOPMENT IS ACROSS CENTRAL/EASTERN IOWA NEAR AND NORTHEAST OF DES MOINES. WITH STRONG INSTABILITY /I.E. 3000-4000 J/KG MLCAPE/ AND DEEP LAYER SHEAR IN EXCESS OF 45 KNOTS EXPECTED...AN APPRECIABLE SEVERE THREAT WILL EXIST WITH LARGE HAIL AND DAMAGING WIND GUSTS POSSIBLE. ADDITIONALLY...ANY STORMS DEVELOPING ALONG OR NEAR THE REMNANT OUTFLOW BOUNDARY MAY POSE A TORNADO THREAT...ESPECIALLY IF STORMS CAN REMAIN ISOLATED RELATIVELY EARLY IN THEIR EVOLUTION. GIVEN THE EXPECTED THREAT THIS AFTERNOON...A WW MAY BE NEEDED BEFORE 21Z. 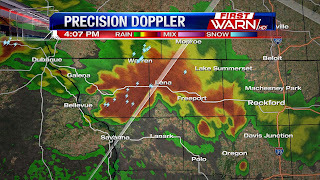 ..COOK/GOSS..
UPDATE: 12:12pm The Severe Thunderstorm Watch has been cancelled for the entire Stateline area. However, severe weather is still possible later this evening. Make sure to stay weather aware. 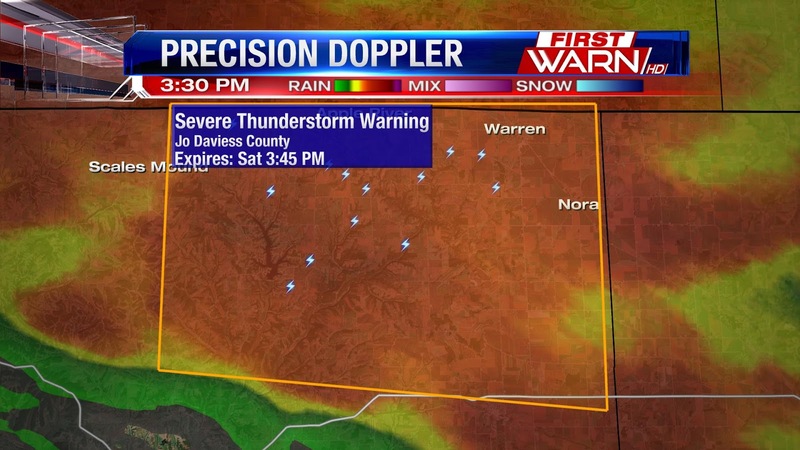 UPDATE: 11:51am Severe Thunderstorm watch has been cancelled for southern Wisconsin Severe Thunderstorm warning for DeKalb & Lee counties has been cancelled. 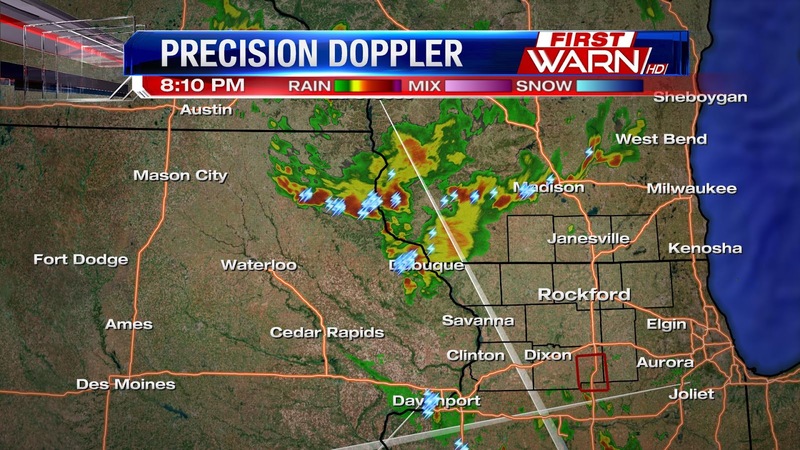 Currently no warned storms in the Stateline. 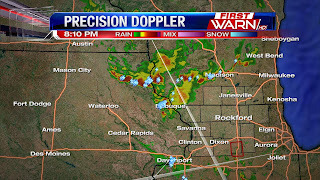 UPDATE: 11:39 NWS has cancelled Severe Storm Watch for Carroll, Jo Daviess, Stephenson, and Whiteside counties. UPDATE: 11:15 SEVERE THUNDERSTORM WARNING extended into SW DeKalb, and Lee until noon. 60mph winds and nickel sized hail. 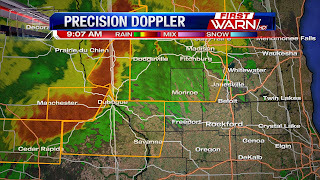 UPDATE: 11:00am Severe Thunderstorm Warning for NW DeKalb, Ogle, and northern Lee county until 11:30am. 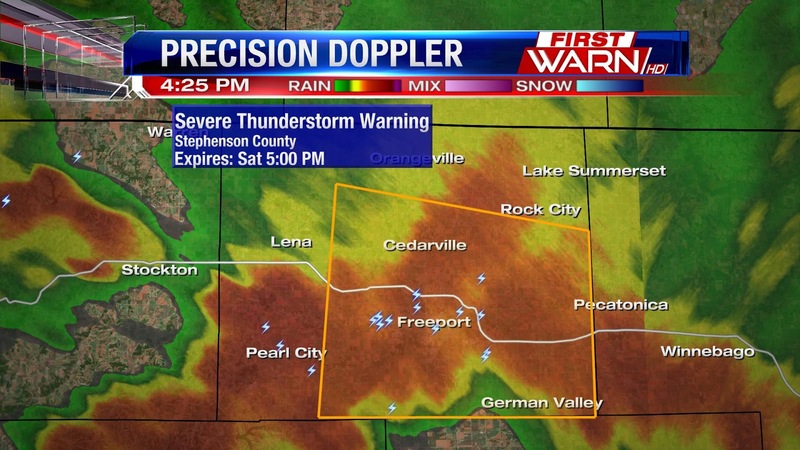 60mph winds, penny sized hail and very heavy rain. 10:29am UPDATE: The Severe Thunderstorm warning for Boone and Winnebago Counties has been cancelled, the storms have weakened below severe criteria. A severe thunderstorm watch remains in effect until 3:00pm. 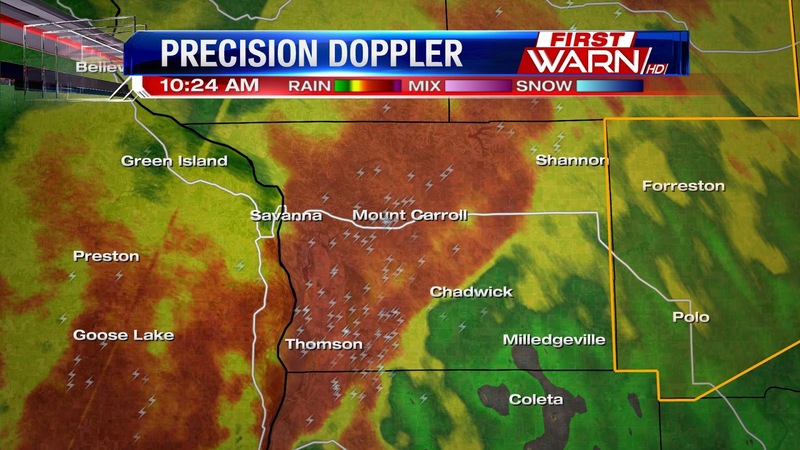 10:28am UPDATE: Strong storms moving into Mt. Carroll, Savanna, Milledgeville w/ lightning,dime sized hail,winds 45mp. 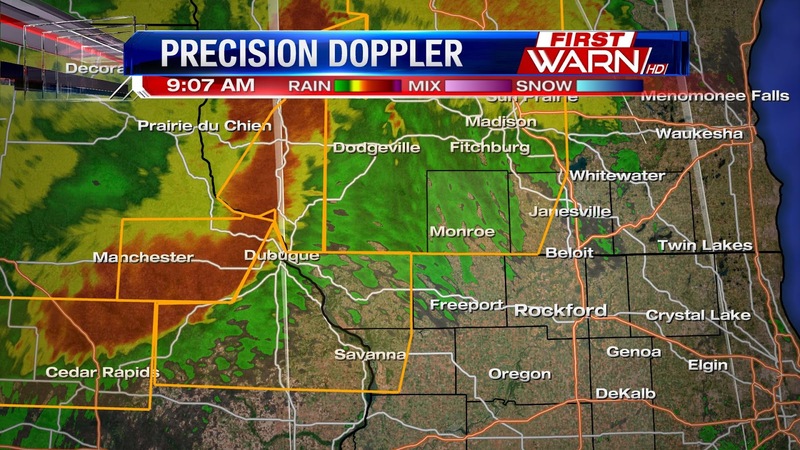 10AM UPDATE: The SEVERE THUNDERSTORM WARNING continues until 10:45am for Boone, Ogle, and Winnebago Counties. Wind gusts up to 80mph creating damage to trees, power lines, houses, and cars. Hail and heavy downpours also associated with this system. 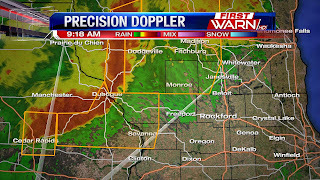 Storm will be to Forreston around 10:10.....Pecatonica around 10:20am....Byron and Winnebago around 10:25am....Stillman Valley around 10:30am....Rockford airport at 10:35am....Cherry Valley around 10:40am....Belvidere around 10:45am. 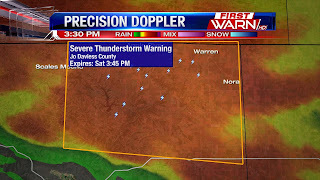 UPDATE: SEVERE THUNDERSTORM WATCH: For the entire Stateline area until 3pm today. 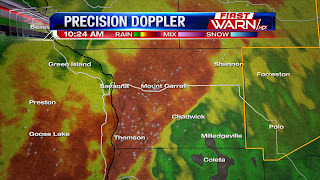 UPDATE: SEVERE THUNDERSTORM WARNING: Continues through 10am, this line of storms has had a history of very strong winds gusts, creating widespread damage in Iowa. Winds have been reported up to 90mph at times. If you are in the warned area make sure to head indoors now. 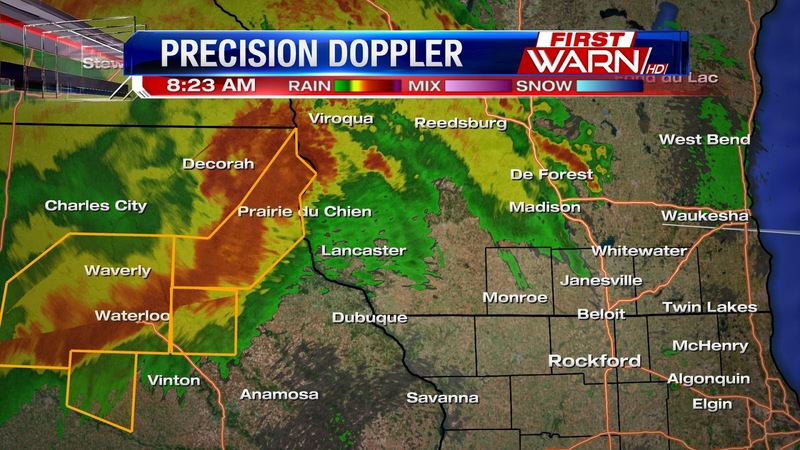 SEVERE THUNDERSTORM WARNING: For Jo Daviess, Carroll, Green, and Rock counties this morning. Widespread wind damage associated with these storms. 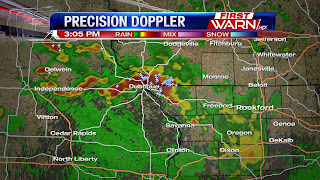 SEVERE THUNDERSTORM WATCH: Now in effect for Green, Jo Daviess, Carroll, and Stephenson counties until 1pm this afternoon. 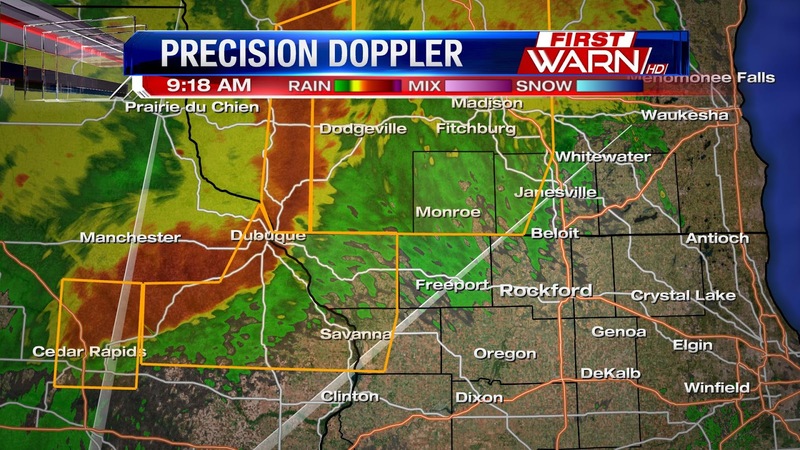 Biggest threat this morning will be strong straight line winds and well as hail. 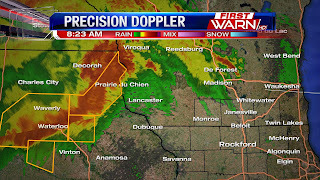 Storms currently in Iowa...looks to move into the area around 9/10am. New SPC Day 2 Severe Weather Outlook -- This is Getting Serious! in the control room and behind the cameras. Thank you! Shot was just before the start of our 6PM news.. This watch is just outside our viewing area -- but remain alert this evening! AT 427 PM CDT...SEVERE THUNDERSTORMS WERE LOCATED ALONG A LINE EXTENDING FROM NEAR GERMAN VALLEY TO NEAR SHANNON...MOVING EAST AT 60 MPH. * LOCATIONS IMPACTED INCLUDE... ROCKFORD...ROCHELLE...OREGON...MOUNT MORRIS...BYRON...POLO... FORRESTON...HILLCREST...STILLMAN VALLEY...DAVIS JUNCTION... CRESTON...LEAF RIVER...ADELINE AND NEW MILLFORD. INCLUDING THE FOLLOWING INTERSTATES... I-39 BETWEEN MILE MARKERS 97 AND 115. I-88 BETWEEN MILE MARKERS 77 AND 83. THIS INCLUDES... CASTLE ROCK STATE PARK...LOWDEN STATE PARK...OGLE COUNTY FAIRGROUNDS...AND WHITE PINES STATE PARK. AIRPORT AND OAKDALE NATURE PRESERVE. AT 328 PM CDT...A SEVERE THUNDERSTORM WAS LOCATED NEAR APPLE RIVER... OR 15 MILES SOUTH OF DARLINGTON...MOVING EAST AT 45 MPH. THIS STORM IS PRODUCING LARGE HAIL. SEEK SHELTER NOW INSIDE A STURDY STRUCTURE AND STAY AWAY FROM WINDOWS. Heavy thunderstorms -- a few of which have been warned for high winds and hail -- are moving in from the west and northwest. I will be following them right here in the First Warn Weather Center and will keep you updated! The quiet weather Friday will change in just a short 24 hours from now as thunderstorms move back into the Midwest. The Storm Prediction Center has highlighted Northern Illinois and Southern Wisconsin under a slight risk for severe storms Saturday afternoon and evening, with an enhanced risk for severe weather for our southwest counties of Carroll and Whiteside. 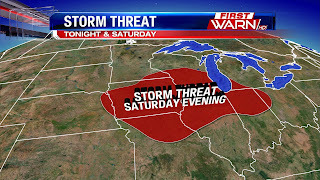 Storms from Friday night will be ongoing Saturday morning in Minnesota and Iowa, but are expected to fizzle out by the time they reach Northern Illinois. As low pressure and a cold front move down from the Northern Plains during the day, a warm front will pull north into Wisconsin. Behind the warm front will sit a very muggy and warm air mass. Dew points Saturday afternoon could reach close to 70 degrees, making the heat index rise into the middle 90's! This moisture will be the fuel needed for thunderstorms to develop during the afternoon and evening Saturday. Initially, there may be a cap - or lid - on the atmosphere to prevent much growth in thunderstorms. 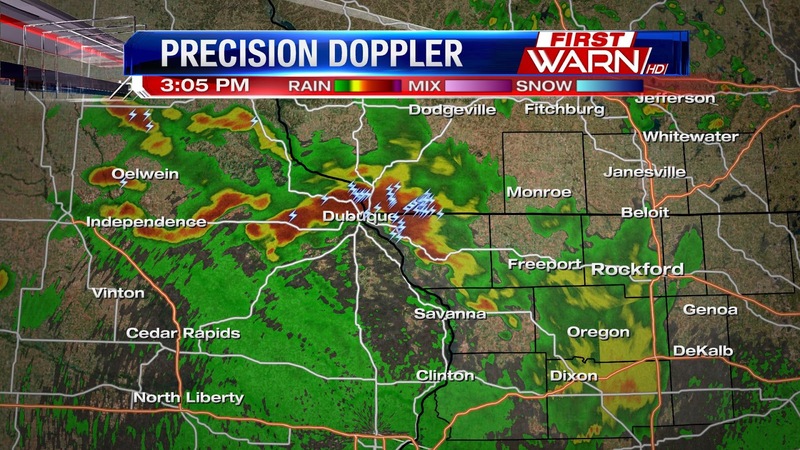 But by 4pm, strong to severe storms are likely in eastern Iowa ahead of the cold front. As that front spreads east into Illinois, the severe threat shifts east as well. Large hail, damaging winds and even an isolated tornado are all possible through Saturday evening. 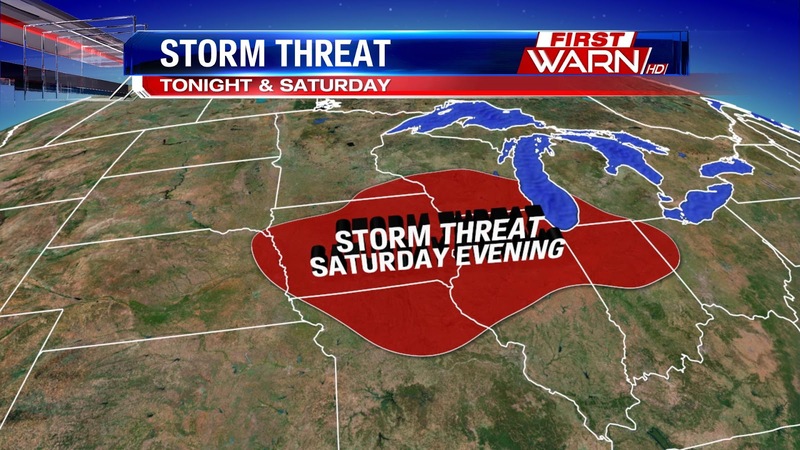 Make sure to stay weather aware Saturday as storms could quickly develop late in the day. We've been able to dry out the past couple of days, and that's been nice. But, the standing water can still be seen from the several inches of rain that fell all last week. Unfortunately, looking ahead to next week the active weather pattern returns to the Midwest and Great Lakes. A ridge of high pressure will build across the center of the country beginning late this weekend. Northern Illinois and Southern Wisconsin will be on the outer edge of the ridge, leaving a direct path for active storm systems. The first of those systems arrives late Saturday, with strong to severe storms likely. After that, thunderstorms roll back into the picture Sunday night and remain in the 7-day forecast straight through the end of next week. Just like last week, the days won't be complete washouts, but the daily storm threat will remain. May 2015 is the Hottest on Record!